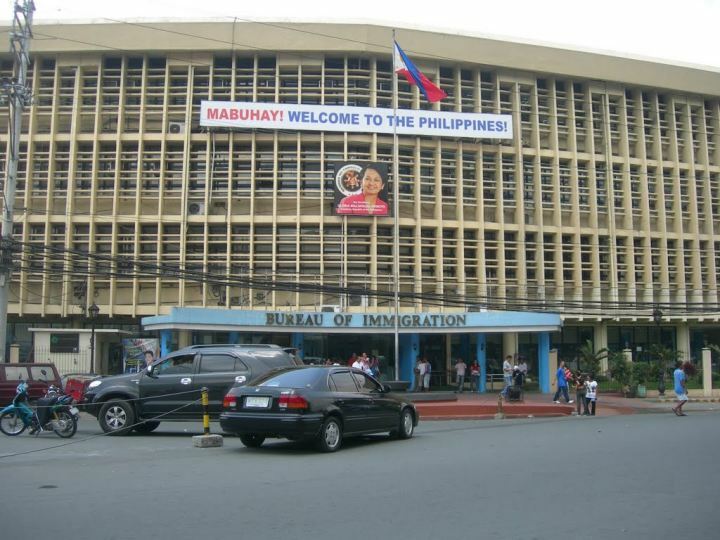 The Philippine Bureau of Immigration (BI) is currently modifying procedures and tariffs. These modifications have not yet been published, but some field offices already do apply them. We therefore recommend to have your visa extended more than a week before expiry date. Information have not yet been confirmed by the BI. 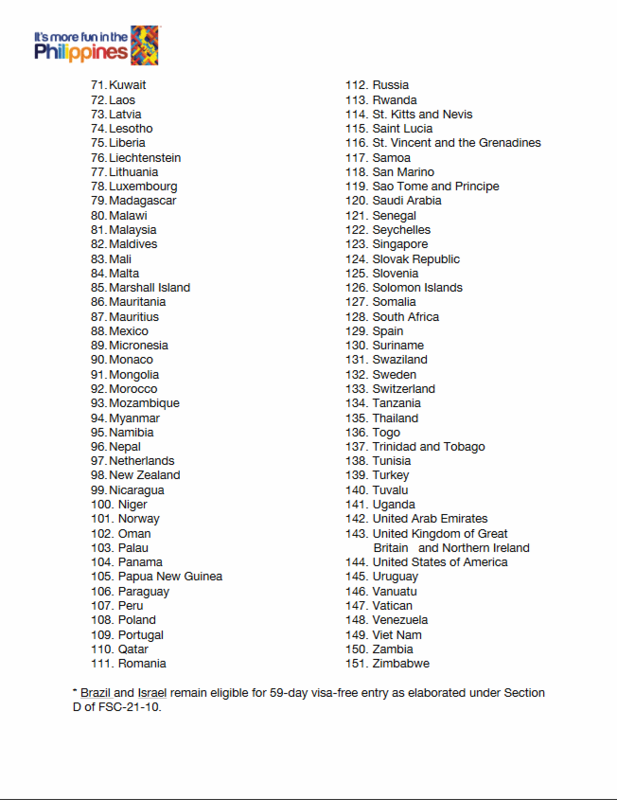 Nationals of over 150 countries do not need a visa to visit the Philippines. On arrival they receive a free Visa Waiver. Tourists can now stay 30 days for free with this Visa Waiver. It is given to them at the immigration desk in ports and airports. The extension of the Visa Waiver for another 29 days costs PHP 3,130.00. When we started "Silent Gardens" ten years ago, the website of the Bureau of Immigration had been just a collection of documents. In the last years this website became a real source of almost up to date information. We strongly recommend to read this legal source. Expatriates can escape from Visa-Run, Annual Report and Emigration Clearance Certificate with an SRRV. Beware of overstay and visa violations. 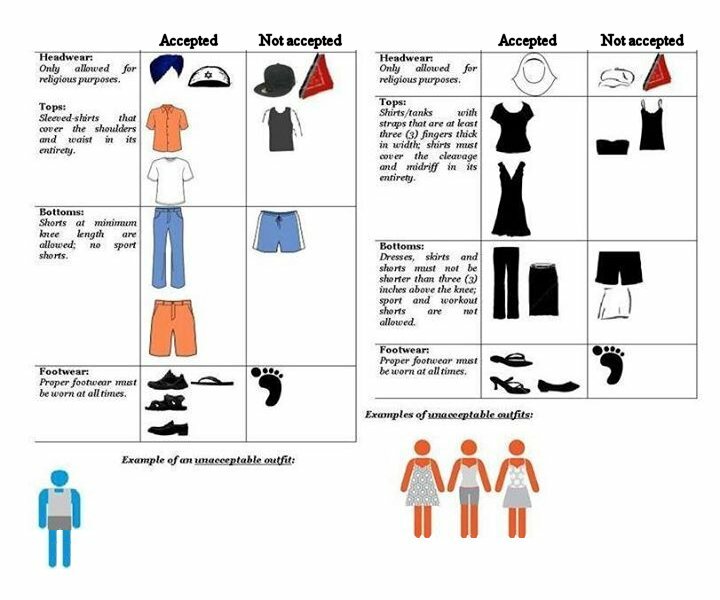 The Bureau of Immigration can be very strict in interpreting the laws. Visa violations and overstay often result in hefty penalties, prison and deportation. People from most European countries and the USA can enter the Philippines without a Visa and will be granted an entry permit (called a visa waiver) for 30 days. This permit may be extended at any Immigration Office in the Philippines for another 29 days and thereafter every two months for up to 16 months in total. Please read the section about Visa Extension for more details. Am I allowed and for how long? Nationals of countries in grey color MUST apply for a visa at the Philippines' embassy abroad. Without visa, you will not be allowed to board a plane or a vessel towards the Philippines. Countries with special regulations are: Afghanistan, Algeria, China, Egypt, India, Iran, Iraq, Libya, Lebanon, Jordan, Nigeria, Pakistan, India, Sudan, Syria, Palestine, Yemen, Taiwan, Hongkong, Macau, East Timor. The Bureau of Immigration (BI) has reminded foreigners that possession of a Philippine entry visa is not a guarantee that its holder will be automatically admitted into the country. 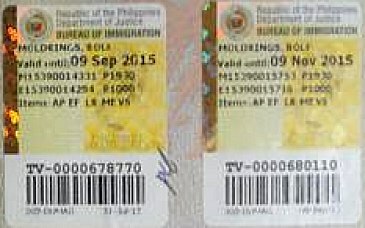 Immigration Commissioner Ricardo David Jr. made the statement following complaints from some members of the Filipino-Chinese community about the alleged excesses of BI officials in preventing the entry of arriving Chinese tourists with valid visas at the Ninoy Aquino International Airport (NAIA). 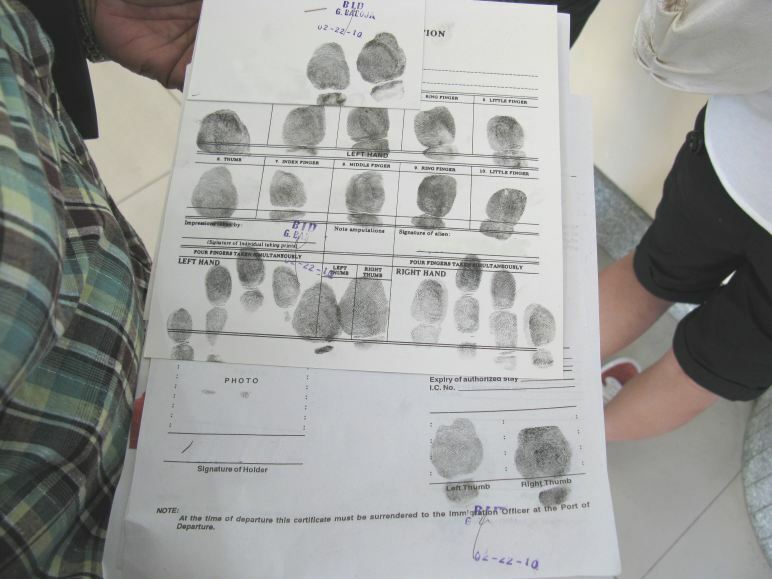 He explained that a visa imprinted on a foreigner's passport merely authorizes the bearer to present himself for admission to an immigration officer in a Philippine port of entry. 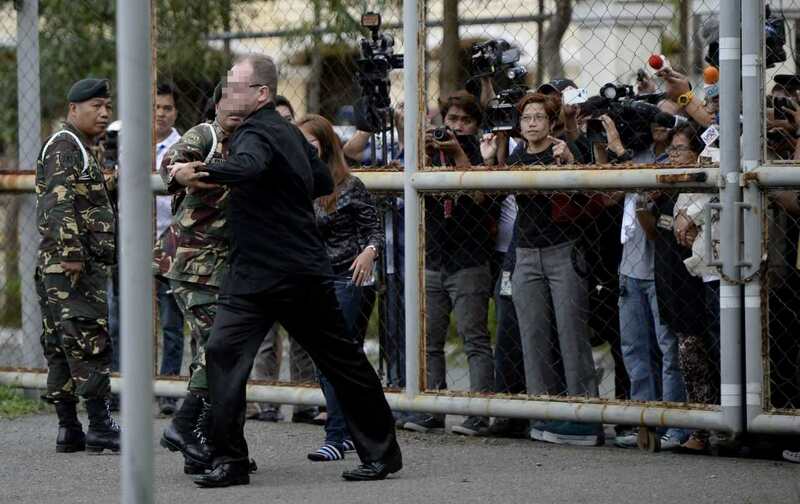 "It denotes that the visa application of the visa holder has been properly examined by a consular officer at a Philippine post abroad," he said. He stressed that the decision to admit a foreign national into the Philippines is the primary function of immigration officers at the port of entry, adding that it is an international practice adopted by all countries throughout the world. "Thus, no foreigner who holds a Philippine visa can invoke his right or privilege to enter the country. He still has to pass inspection or assessment by our immigration officers who will determine and decide if he should be admitted," David said. "If upon inspection and profiling a foreigner is found to be improperly documented or is deemed as likely to become a public charge or a threat to national security, public health and safety, he will be excluded," David said. The official clarified that in most cases the immigration officers involved in preventing the entry of foreigners did not abuse their discretion but only did their job because the aliens they excluded were profiled as public charges. Basically, an arriving foreign tourist is deemed a public charge if he cannot explain his purpose in visiting the country, does not have hotel accommodation, return ticket and does not have sufficient funds to support his stay. On allegations that some immigration officers have been extorting money from tourists, David again challenged the accusers to name names so that those responsible could be punished and dismissed from the service. "These sweeping allegations of corruption by our airport personnel without the culprits being pinpointed have only besmirched our bureau to the detriment of those who are uprightly doing their job as gatekeepers of our country," he said. The stamp shows the arrival date, the flight number and the date of expire of the visa-waiver. 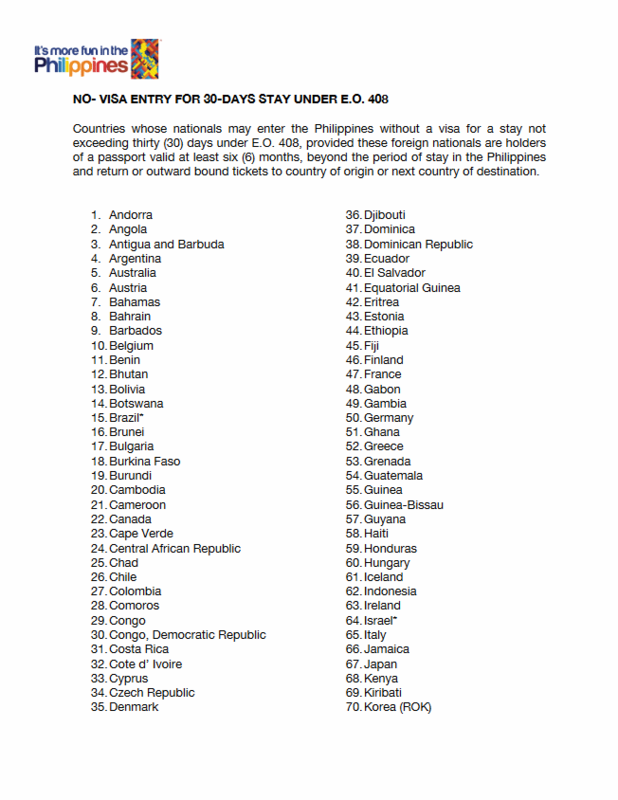 If you have a visa from an embassy abroad with more than 30 days of stay, please verify the expiry date on the stamp. corresponds to the duration of the visa. Often the immigration officers do not change the date on their stamp and so does not corresponds to the duration of the visa. 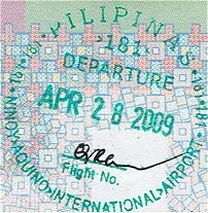 The stamp shows the departure date and the flight number. 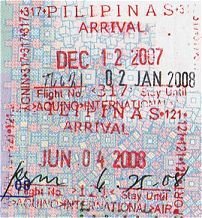 If you plan to come back to the Philippines, make sure that the stamp is readable. You will need the stamp's date on your next arrival. Prices for Visas are taken from the Philippine Embassy in Germany but should be similar in all other countries. If you are married to a Filipino citizen, you may ask for a Balikbayan Stamp in your passport at the Immigration point where you want to enter the Philippines. 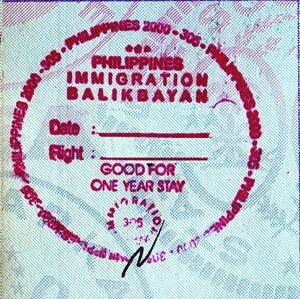 A Balik Bayan stamp is good for 1 year and is free of charge. You have to bring you marriage certificate in English, your Filipino Spouse and you have to ask the Immigration Officer for it. Please read under Balikbayan Stamp for more details! If you are already retired and/or at least 35 years old, you may also apply for a Special Resident Retirees Visa from the PRA ( Philippine Retirement Authority). This Visa is not only for retirees, but also for investors and other people who just want to live in the Philippines and can prove their financial status. It seems that you now can extend your stay in the Philippines for up to 36 months without having to leave the country. But in the last months friends reported to us, that you are questioned when you have lots of extension stamps in your passport and that extensons above 16 months need additional information. We strongly recommend to read the visa pages of the Bureau of Immigration. Most foreigners enter the Philippines without any Visa and they get a stamp, called a Visa Waiver, in their passports which is good for a 30 days stay. If someone wants to extend this stay, one would have to go the nearest Immigration Office and get the extension good for another 29 days. The cost for this first extension is 3,030 Pesos. When you are already 59 days in the Philippines and want to stay a bit longer, then your regular extension series starts. You have to show up at an office of the Bureau of Immigration a couple of days before your Visa Waiver expires. Or, come now - pay later! *Fees are updated as of 06 March 2014 and may change without prior notice. (Official text from BI). We have ammended with current information sent by readers. 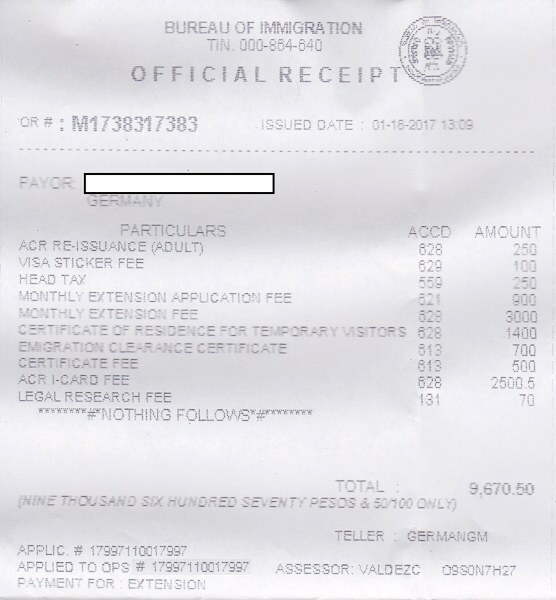 IMPORTANT: When you extend your visa keep the receipt from the BI office. You'll need it for your next extension and for your ECC. Without receipt no ECC! See also here. And a new fee ... 100 pesos only! IMPORTANT: You can only get two 6 months extensions within the allowed maximum of 36 months. All other extensions are 2 months only. The first 6 months extension can only be obtained after the initial free 30 days and the following 29 days. After this 59 days you'll get a Tourist Visa and an ACR-I card. Read more information about the ACR Card. Standard validity of the visa extension is 2 months, but you now can get 1 month or 6 months also. This last extension needs to be verified. The open question is the "Annual Report Fee". The total amount for one year's extensions is at least PHP 25,480.00 only! This is why expatriates often call the Philippines: Fee-lippines! Consider two 6 months extensions if you stay for a year. This would cut your expenses. Since 2015 you can extend your Visa for up to 36 month in total. After 16 month however you should make a Visa Run or try to get another extension for up to 24 months from the "Chef of the Immigration Bureau for Regulations". This might become too complicated, so it might be easier to make a Visa Run or to try to get a permanent resident visa. If you do not want to stay weeks or even months at the Bicutan Detention Center then you should really fully comply with the immigration law of the Philippines. The Bureau of Immigration can be very strict in interpreting this law. Visa violations and overstay often result in prison and deportation. "Café carré" the "resort" of the Bureau of Immigration Detention Center in Bicutan. 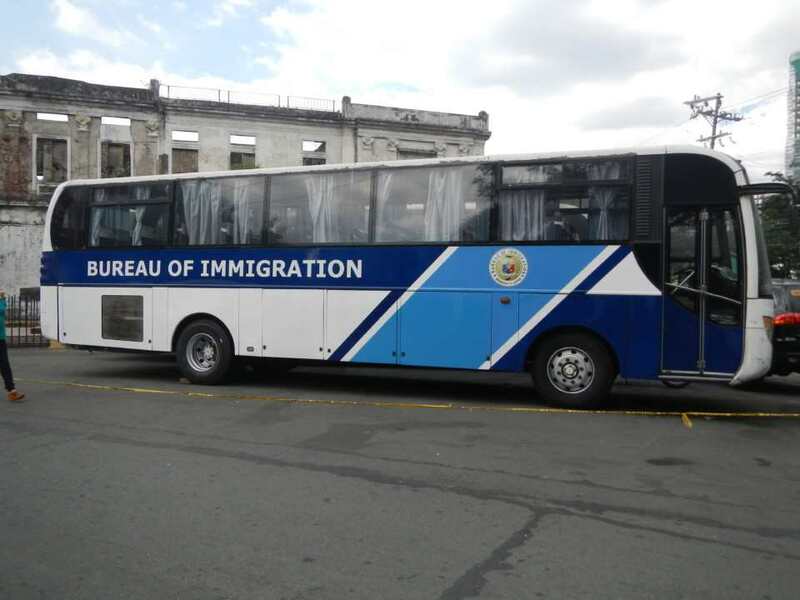 Bureau of Immigration Detention Center in Bicutan, Taguig, also called "Café carré"
Currently the Bureau of Immigration runs a program of citizen awareness. Any Filipino or Filipina can send a text (SMS) to BI and denounce a foreigner suspect of illegal immigration or overstay. 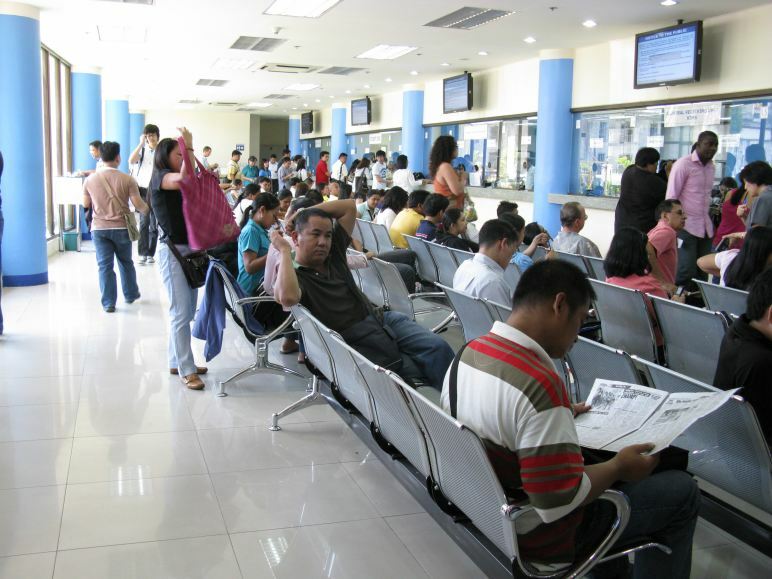 We recommend to fully comply with the immigration laws of the Philippines. You won't like to see your picture (in the original it is clear) in press and on TV-screens. You better do not travel with this bus. 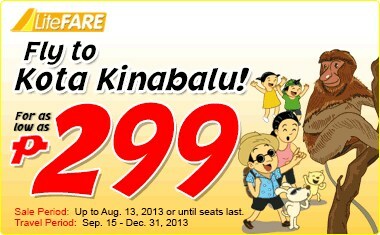 It might be your last journey within the Philippines. Many expatriates who live in the Philippines with either an extended visa-waiver or a 9a tourist visa prefer to travel abroad for a day or two instead of paying a lot of money just for a stamp in the passport. A good moment for a trip abroad is before the end of the 6th month and before the end of the first year. As you know exactly when these expiry dates will be, you may book a promo flight already months before. Preferred "Visa Run" destinations are Kota Kinabalu, Bangkok and Hongkong. If a foreigner (alien) lives for a long time in the Philippines, one day his/her passport expires. Most embassies can produce a new passport within 10 days to 2 weeks and send it to you by a courier service. But your permanent resident visa, your Balikbayan stamp or your SRRV still sticks in the old passport. The transfer of a visa from an old to a new passport is called "re-stamping" in the Philippines. The procedure depends on your visa. You'll have to go to Manila. The re-stamping is only made in BI head office in Intramuros. Here is the current form to fill in and to bring with your old and new passport. BI has invented a new "express fee: Simple or Double - Lovely Fee-lippines! Contact PRA. There is nothing about visa re-satmping to find on their website. Their website is currently being overhauled. Leave them your phone number and your SRRV number. They call back within a day. 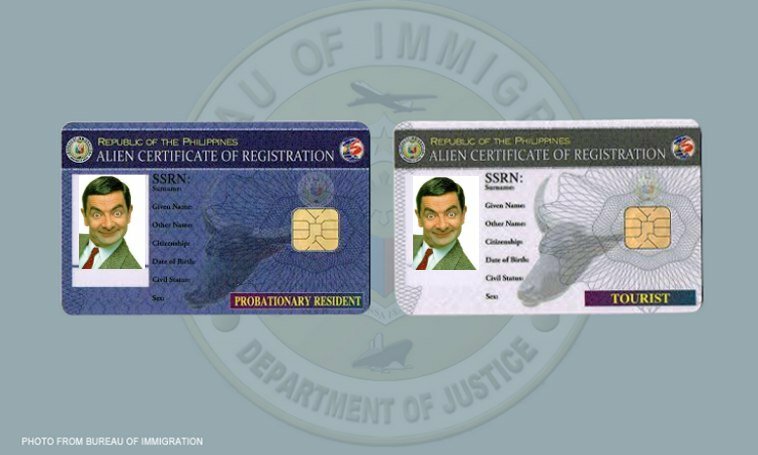 The Alien Certificate of Registration (ACR) I-Card is requested from any foreign person (called alien) who stays more than the 59 days. This means that tourists with a 9A visa are requested to have an ACR-I card issued, when they apply for a visa extension after the 38 days extension.. 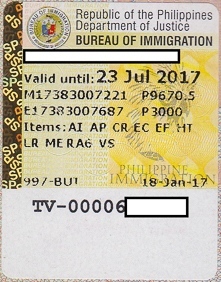 The ACR-I cards are only available in some offices of the Bureau of Immigration. 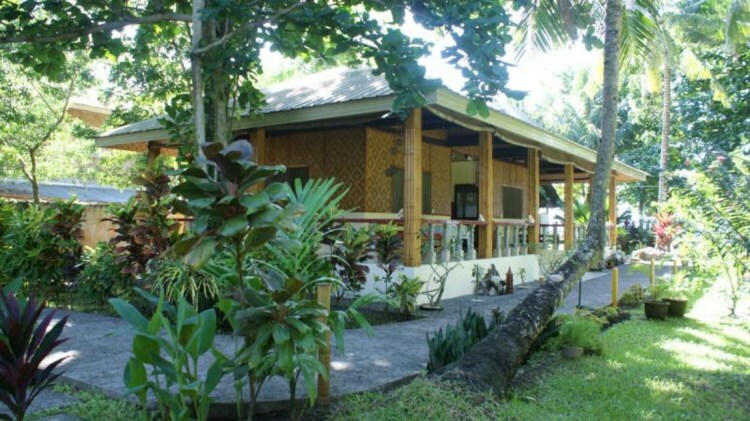 Please inquire here! Processing time is about 2 weeks! You will have to get your card at the BI. The advantage of this ACR-I card is that you can open a bank account, register a car or a motorbike or even get a driver license without being a permanent resident. The ACR I-Card is needed to get and the Emigration Clearance Certificate (ECC), and serves as Re-entry Permit (RP) and Special Return Certificate (SRC) of the holder upon payment of the required fees. Since July 16, 2015 new ACR-I cards in different colors are issued. Long stay tourists (more than 59 days) get a white ACR-I card. The easiest and (initially ;-) )the cheapest way to get a long term visa for the Philippines, is the Balikbayan Stamp in your Passport. This stamp is good for 1 year and can be extended at least once for another 6 months. To get a Balikbayan Stamp in your Passport on arrival, you must be married to a Filipina/Filipino. You must present an English translation of your marriage certificate and your Filipina wife or Filipino husband must be together with you at the point of immigration. Most important: You have to ask the Immigration officer for it, they won't give it to you automatically. 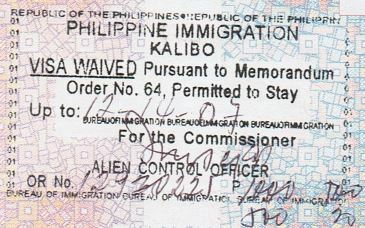 The Balikbayan Stamp is available for direct relatives of Filipino citizens and former Filipinos who have changed their citizenship to another country. If your Filipino husband or wife still has a valid Philippines Passport, he or she doesn't need a Visa or stamp in their Passports of course. Another way to get a permanent residence visa for the Philippines, is the Special Resident Retiree's Visa or SRRV . This Visa does not depend on whether you are married to a Filipino citizen or not, like the 13A Visa but it is based on a money deposit in a accredited bank in the Philippines. 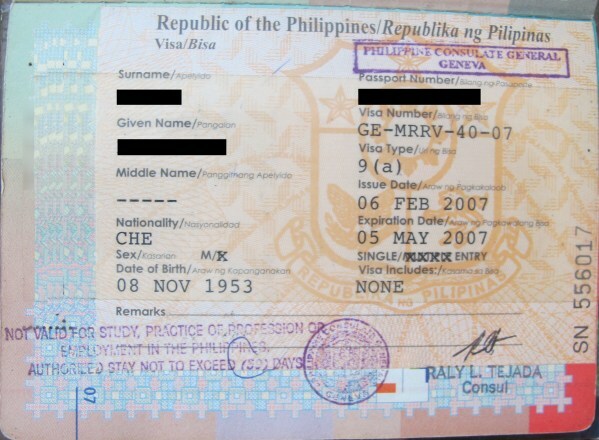 The Philippines advertise this kind of visa with some advantages such as: Exemption from Customs Duties & Taxes for the importation of personal effects of up to USD 7,000.00, Exemption from Travel Tax, Exemption from the Exit Clearance and Re-Entry Permits, Exemption from the Immigration ACR-I Card, and from annual reporting. The holder of an SRRV has also the privilege to pass through the diplomatic channel at the immigration at the airport. If you are interested in an SRRV, then we recommend to carefully read the website of the Philippine Retirement Authority (PRA). Every foreigner who has been for more than 6 months in the Philippines, will need to get an Emigration Clearance Certificate (ECC) before leaving. This clearance can only be obtained in the BI offices in Manila, Cebu and Davao. A fee of about PHP 1,210 shall be collected for the ECC. Those who have an SRRV are exempt of this certificate! Go to the Reception Desk and tell the Immigration Officer sitting there that you need an Exit Clearance Certificate. She will ask to see your Passport and air ticket She will check to see if you have applied for all Extensions necessary for your stay. She will hand you a form to complete. You complete the form and return it to the same Receptionist and hand her your three photos. She will affix the photos to the form. You go to the "Cashier 3" window and hand in the form and your Passport. These will be checked and stamps are placed on the form; your Passport and form are handed back to you. You now go to "Cashier 1" and again hand over your Passport and Form. 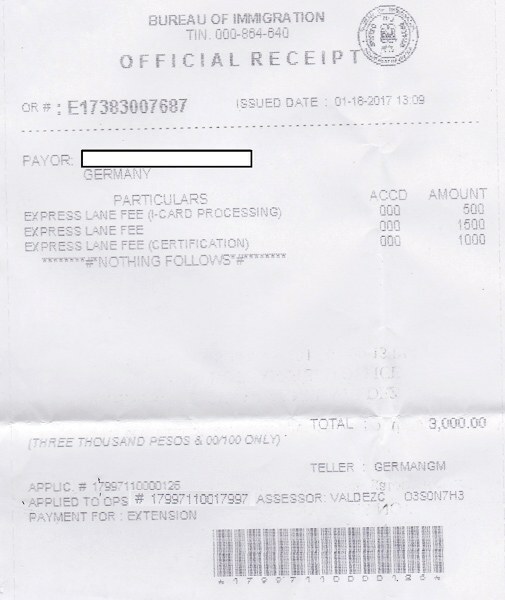 If you have a 9(a) Visa in your Passport (from a Philippines Embassy abroad) you will only pay an "Express Lane" fee of PHP500. 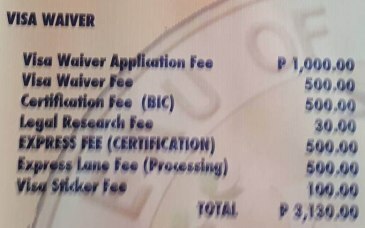 If you don't have this Visa or if you have a Visa that grants residency (9(g), 13(a) etc), you'll pay considerably more (around PHP2900 + the PHP500 "Express Lane" fee). * You now sit and wait a few minutes before you will be called to be finger-printed. This takes place next to the "Cashier 1" window. After a few more minutes you'll be called and your Passport and ECC handed to you. That certificate you hand to the Immigration Officer just before boarding your international flight. In the Manila Head Office it may take you one and a half day to get the ECC. And then it's really frustrating when nobody at the airport asks for this paper. Keep smiling! You should also check the address list on the website of the Bureau of Immigration. Unfortunately none of the lists is up to date, neither theirs nor ours! Many phone numbers are cellphone numbers and many e-mail addresses are private 'gmail' or 'yahoo' addresses. 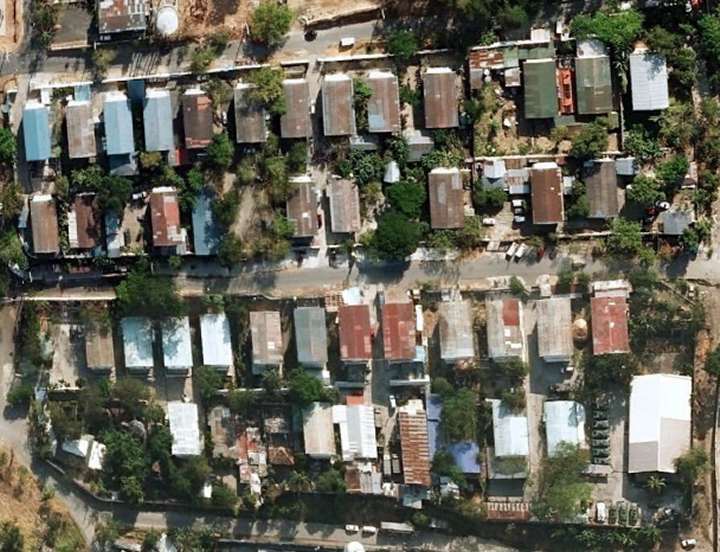 If you want to help us, please inform us about address or phone number changes." PEZA Building Ground Floor., Corner San Luis St.
2nd floor Melval Bldg. RF Balizi St.
Joe Marias Bldg, Magsaysay St.
Unit 7, 2nd floor, Phonecian Bldg. Panganiban Drive, Cor. Isarog St.
2nd floor Sarabia Co, Torralba Bldg. Door #8 Lu Pega Bldg. 2nd floor G & M Villacor Bldg. Cinemar Traders, JV Avellino St.
3rd floor, Rural Bank Bldg.